Everyone who is in a chicken rut, please raise your hand! Yeah, I know you are - you make that same chicken dish over and over because you know it will turn out well, but it's time to expand your horizons. 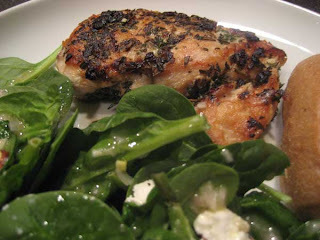 Making Rachael Ray's Panfried Chicken with Spinach Salad is a safe bet. You can find it in the October 2006 issue of Every Day with Rachael Ray. This recipe is really a cinch to make. It's easily a 30 minute meal, even with making the chicken and the spinach salad, too. It's a good alternative to the average chicken recipe because it's so simple and so full of flavor, too. 1. Preheat the oven to 200°. In a small bowl, combine the rosemary, thyme, garlic and 2 teaspoons salt. Rub all over the chicken. 2. In a large skillet, heat 2 tablespoons olive oil over medium-high heat. Place 2 chicken breasts, skin side down, in the pan and top with a heavy skillet to flatten. [I didn't have a heavy skillet that fit in my large skillet, so I just pressed down on it with a spatula.] Cook for 7 minutes, turn and fry until cooked through, about 4 minutes. Keep warm on a baking sheet in the oven while you fry the remaining chicken in two more tablespoons olive oil. 3. In a large bowl, whisk together the remaining 2 tablespoons olive oil, the vinegar, shallot, mustard and 1/4 teaspoon salt. Add the spinach and toss; top with the goat cheese and toasted walnuts. Serve with the chicken.